Newcastle 6 – 1 Barnsley – Move. Run. Sports. We had to wait until just before half time for Peter Lovenkrands to open the scoring from the penalty spot after he was taken down by Barnsley goalkeeper Steele who was also sent off. A rather harsh sending off I thought after seeing the replay’s at half time. But never mind it happened and the Toon went in 1 up at half time. I don’t think anyone at half time would have expected to see 6 more goals in the second half as the way the first half went it did not look likely. I guess this is a prime example that football is indeed a game of two halves! 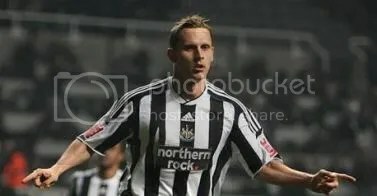 Newcastle really did come out all guns blazing and Lovenkrands doubled the scoreline and his tally in the 48th minute which a lot of people missed as they had to returned to their seats for the second half. Danny Guthrie made it 3 nil two minutes later with a shot just inside the box, which saw two Newcastle players duck out the way of it and it hit the back of the net. At this point I was beginning to think my 4 nil bet was going to be much over run. In the 60th minute Jonas Gutierrez cut inside and fired a brilliant 25 yard shot which hit the back of the net, St James Park was roaring when he took out the famous Spiderman mask as part of his celebration. It really was a great moment. With 30 minutes left to go I knew my bet was not going to come in as we just seemed to look brilliant in front of goal. In the 69th minute Danny Guthrie grabbed his second and our fifth from a free kick which seemed to miss everyone and hit the back of the net! Two minutes later Kevin Nolan completed our scoring from inside the box to make it 6 nil. However, a consolation was to be given to Barnsley when we stop concentrating for a few seconds in the 83rd minute, with Bogdanovic scoring. Cant complain at all after this performance and just have to hope we can keep this winning form up for the next two months and really win the Championship in style. West Brom lost again today, and Forest who are yet to come to St James Park win in the last couple of minutes today. Which still puts us 8 points ahead!